Cat wheel loaders have set the benchmark in the heavy machinery market and you can now rent one for your business exclusively through Al-Bahar. Wide variety of sizes and packages available to best suit your needs. Intelligent power management system monitors operator input and maximizes efficiency. Al-Bahar proudly brings to you an exclusive line of wheel loaders from Cat; built for perfection and delivering results to generations in the industry. 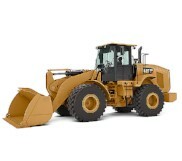 The largest wheel loader, the Cat 994F revolutionized the market, and Cat products continue to do so. We have a wide variety of Cat wheel dozers available for rent in UAE, Kuwait, Oman, Bahrain and Qatar. Cat wheel loaders are pre-equipped with compatibility couplers so that all Cat attachments can easily be used and interchanged amongst the heavy machinery. This not only standardizes your fleet, but also brings your overall cost of production down by providing the most reliable and versatile solution to every need. To find out more about renting a Cat wheel loader from Al-Bahar, fill in our contact form and have a specialist get back to you in no time at all.